Chevrolet is leaning hard on product placement in Transformers 4: Age Of Extinction to get the Chinese market fired up about their product. But it's not the Camaro they're expecting to get the most mileage out of; it's their new micro SUV the Trax. Deborah Harpur, chief executive of Mogul Inc., an entertainment marketing agency specializing in product placement told The Los Angeles Times; "This is the first big American brand making a play for China via product placement." 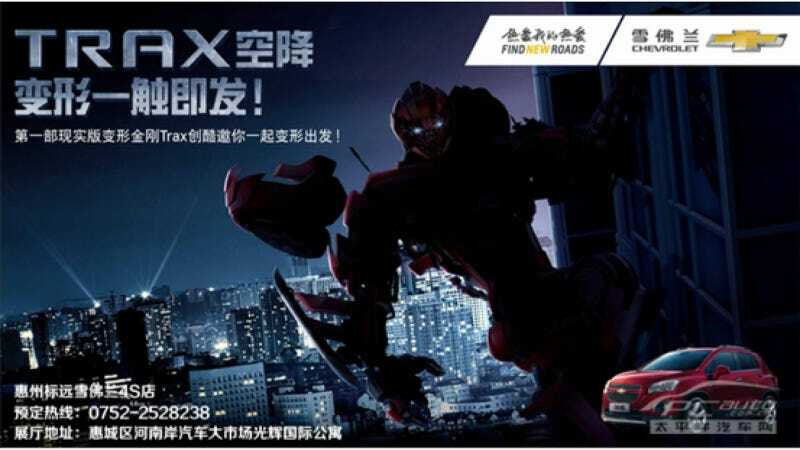 Apparently the Chinese are absolutely nuts for transformers, and spent $165 million going to see the franchise's last flick which pulled in a worldwide total of $1.1 billion. Starting with the Trax, the LA Times tells us GM plans to add 11 new SUV to their lineup in China by 2018. They reckon the Chinese will be buying seven million SUVs a year by 2020, and we already know Chrysler is looking to get a piece of that as well with their new Jeep offerings. Based on all that it sounds like weapon-wielding robots are the perfect pitchmen to sell the tiny Trax in China. The vehicle will be available in the US as well starting early next year with a 1.4 liter EcoTech turbo engine and optional AWD.